I’m afraid the “new homophiles” at First Things and the like are going to get all too much mileage out of the part about valuing a homosexual orientation per se. What they need to be told is that they are just plain wrong, that there is nothing whatsoever valuable about a homosexual orientation, because it *just is* an inclination to sin. Well-written and persuasive post Jeff. This synod seems a particularly ripe environment for heresy to rear its head. The Catholic Church isn’t going anywhere, even if a majority of the hierarchy apostasizes. Stay with the Faith and with those bishops who keep it. Meanwhile, be patient. Things are getting more clear by the day. Excellent comment: “anchor in chaos”! I converted to the Church in 1966 and subsequently watched her lean strongly toward protestantism. With all the chaos today in the world, my only respite was the Church. Now the Church seems to be pulling up the “anchor” that helps our sanity in this crazy world! That said, I would never leave the Church. I get the feeling Pope Francis don’t like my traditional Catholic family with one dear courageous Wife and 11 children that counts the Rosaries we pray for His Holiness and the Holy Masses we offer at our local God fearing SSPX quasi parish. No where in this post do you mention Mary… nowhere in it do you mention the Rosary… no where in it do you bring up Our Lady of Fatima despite this being such an important anniversary… no where do you point out that only through her Immaculate Heart will the triumph come…. you clearly despise, reject, and disdain Our Lady! I am sure you catch my drift ;-). I’m not saying this post is without valid points (I too take issue with the notion of “valuing” and intrinsically disordered orientation). I just want to present a reminder that we should save our breath when complaining about what others “leave out,” and instead focus on what *is* said. You rightly point out there is honor even among thieves. Just about all of that document (with perhaps the aforementioned exception) can be viewed in that light; why not do so? The life of the Pharisee must be an extraordinarily miserable one. Perhaps they could salve their wounds with even more gold, ermine, and cilice. It’s becoming more hard by the day to give the honor, respect and obedience due the Hierarchy – including the Pope – when every day you see/read/hear of them rejecting the traditional “good order and discipline” of the Catholic “family”. Every day they more and more tell us black is now grey, and yes is now maybe, and mortal sin is now not so bad and Our Lord is just oh-so-merciful and he won’t condemn us for receiving HIM unworthily. It is difficult not to run screaming from the house. But where else is there to go? Nowhere. So you stay and just remain a part of the family, but you resist, you disobey, you challenge… everything that goes against “the good order and discipline” of the family and that is detrimental to your and your families Salvation – and continue to pray like hell. Especially the Rosary, the only weapon that can stop this madness. Many people thought the church was going to change her teaching on birth control — just before Humanae Vitae came out and anchored it more firmly instead. Keep the faith, pray, and be patient. The cardinals could stop this Pope and the Synod juggernaut in their tracks if only a few of them came out with a joint public statement formally renouncing the Relatio and calling upon the Pope to affirm traditional Catholic teaching and discipline immediately, just as Cardinal Burke has suggested. Ah, LWC drops by with yet another Pharisee reference. It must be extraordinarily miserable to have an unquenchable need to insult others and yet be saddled with such a limited and predictable vocabulary. Wowbagger the Infinitely Prolonged you aren’t. Clearly the deipnosophist I am not. I seek only to indict hypocrisy where I find it. Surely many of you are aghast at even those invited guests at Jesus’ table; many of whom Burke and his ilk would prefer be thrown into the street wailing gnashing their teeth. Like the guest in Jesus’ parable about wedding feast from this past Sunday’s reading? Again, with the stale Pharisee references. Of course, to credibly indict people, you’d have to actually know them…making your tired insult tours all the more ironic and un-Christ-like. Not that it’ll stop a crusader like yourself. Deus vult. That ‘tired’ enough for you? No, but that would require you to actually *know* the fruits of their lives. Which you clearly do not and have no interest in finding out. So, you follow the intellectually lazy (and spiritually-dubious) route of label-and-condemn. So, yeah. You just detonated the irony meter. @DrPrice2 Indeed. I’d apply the same template against the fruits of Gay Catholics. I’m altogether certain there exists just as extraordinary and pious acts among them. The time has come for The Greatest Apostasy in the Church. Get ready for The Great Chastisement. How sad to read the outcome of The Synod to suit this sinful world. God help those who vote for these changes. They will be responsible for leading millions to the spiritual slaughter! Jesus loved everyone and still does, but I’m sure the sins we commit still hurt him, and leadership like this must anger him. How many young people will be lead down the garden path by these kinds of ungrounded in scripture beliefs. They have to know there is sin. They have to know where the standard is and the Catholic Church has always been the standard bearer. We will be no different than all those other christian religions who believe in the bible but take out the parts they don’t care to hear. Such as “you are saved by grace alone” – I guess they didn’t read the other parts of the bible that add “and all good works” They threw that sucker out with the bathwater”! This kind of liberal, wishy washy trash is not worthy of being discussed at a Synod of Bishops, let alone voted on. I really felt good about this Pope. Now I am wondering and I will be watching to see how he acts regarding these suggested changes. If this goes through, we will know he is the Anti-Pope that Malachi was talking about. Malachi predicted correctly regarding the Popes since the 1300reds. Our eyes will be opened and we will see. Truth will prevail, but the Bible does say that only a few will be left as believers when Jesus returns. I could see how that could happen if the leaders of our beautiful faith move this far away from God! 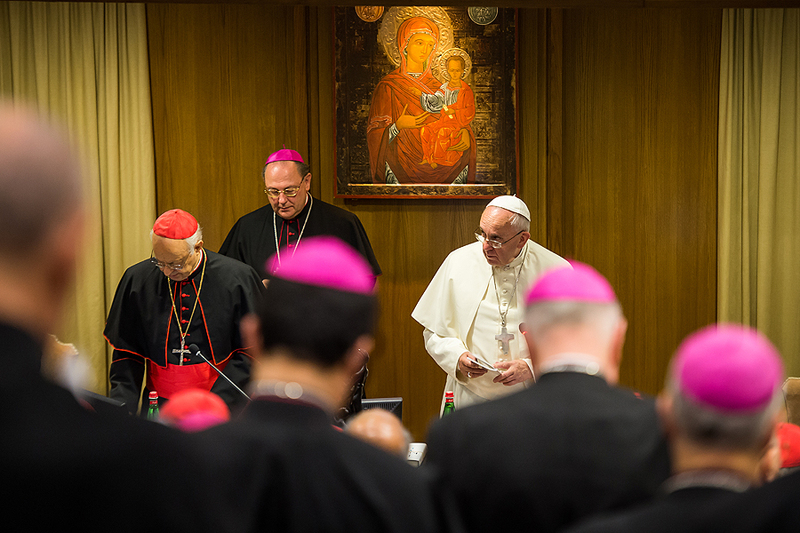 Sadly, several Bishops will not form a faithful cadre and walk-out of the fiasco of a Synod, publicly denounce it, and list the reasons for their actions. Had this happened at Vatican 2, we might have avoided many of the heresies trailing in the wake of that Council but the Bishops then missed the time of their visitation and they will also miss the time of this visitation of Christ. One can either stand with Christ or continue to participate in this perverted progressive process whose conclusions were arrived at prior to the 1st meeting of the Synod in ways similar to how Vatican 2 was a progressive conspiracy actualised sequentially; that is, a conspiracy had not only formed prior to V2 but had plans in place to mount a successful coup on the first day of the Council. The Bishops who waited until after the Council to try and mount an opposition to the revolution were subjected to dynamic silence and other malign methods of media control. Strike NOW, or forget it. There is a reason why the Pope has cultivated warm relationships with the presumptive enemy, the media; they will provide him cover once these indefensible changes are introduced as but pastoral praxis that, even as they drain substance from Doctrine, will be claimed to have kept those same Doctrines in place. Romans 1 is crystal clear that the actions of sodomites are evil and kindle the wrath of God and are deserving of death AND also deserving of death are they who support sodomites. Amen. M.J. denounced it, several times, on his crummy blog and he has also denounced it in a letter to his Bishop. What does one drink when reading a letter of excommunication?